When a famed street is both conceptual and geographic, as Seventh Avenue in New York City is, commenting on it becomes many-pronged. 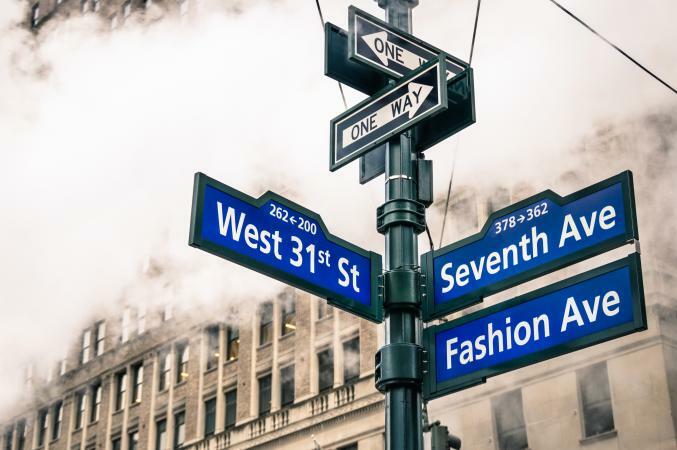 To David Wolfe, the creative director of the Doneger Group, a major buying office, Seventh Avenue is a state of the mind, the creative epicenter of American fashion. He believes that where it once was a vital apparel and distribution center, it now functions as a showcase for designers and manufacturers. To Wolfe, "It is more than a street or a neighborhood, it is the geographic symbol of the power of American style." In the 1930s, the Garment Center, as this area was called-between 6th and 9th Avenues from 30th to 42nd Streets-was the city's largest industry, and the fourth largest in the country. Three-quarters of ready-made coats and dresses, and four out of five fur coats worn by American women, were made here. Surprisingly, over the years, not that many books have been written about Seventh Avenue, the reality, but one author (and manufacturer) who tackled it was Murray Sices, who in 1953, could still write in his tome, not surprisingly, called Seventh Avenue, "Seventh Avenue in the city of New York, between 35th and 40th Street, is not merely a geographic location. It's a legend. It's the birthplace of miracles. It's the fast-beating heart of an industry whose bloodstreams course through America. … Here with almost 4,000 firms crowded into a few square blocks, you have a concentration of apparel manufacturers such as the world has never seen elsewhere." That was then, this is now, and there have been many changes, most of them disastrous for Seventh Avenue and its environs. In 2000 alone, citywide garment-making jobs fell to 60,700 down from 70,100 in 1998. There were 3,260 apparel-making shops in 2000 as opposed to 3,591 in 1999, according to Crain's New York Business Magazine. The publication reported in 2001, "Voluntarily or not, garment workers in New York are mobbing the exits." Industry watchers were shocked at what was happening, especially those who thought the employment drop had bottomed out in the late 1990s. Historically, however, there has been a loss of manufacturing jobs going back more than thirty years. Gone are many wholesalers and textile companies as well as companies that supplied everything. Garment manufacturing has dropped along with everything else, from buttons to zippers and other necessities for a complete garment; even jobbers have disappeared and positions in showrooms also have evaporated. Also there is the major question of rents that have reportedly increased in double or triple digits. Cheap imports, too, have become major culprits in the changing face of Seventh Avenue. On the slightly brighter side, even though manufacturing of apparel is down from the 300,000 workers at its peak in the 1950s, clothing accounts for about one-fourth of the manufacturing jobs in the city, and it's still a most important entry into the business world for immigrants from everywhere. Seventh Avenue and its surrounding businesses probably will endure, because designers, even in the age of the computer, will still need workers nearby to whip up small runs of high-end clothing. However, that segment of the business is also no longer so significant. At a time when conglomerates have swallowed up many of the major department stores, and specialty stores and discounters swamp shopping malls, the ability to ship quickly is no longer so vital. Bud Konheim, the head of Nicole Miller Inc., one of Seventh Avenue's stalwarts, still refers to himself as a "quick turnaround guy," and retains his belief in "Made in the U.S.A." through thick and thin. In the early 2000s, Crain's reported that the New York Industrial Retention Network would release a study showing 60 percent of apparel leases in the garment district will expire momentarily, putting the entire local industry in a negative position. Even though everything is changing, there is still plenty of excitement just walking Seventh Avenue and the adjacent Broadway buildings like 1410 Broadway or 550 Seventh Avenue. Models still run to do a day's work at a manufacturer's showroom during New York Fashion Week. The Tower of Babel voices from different cultures still are part of street life and lore. There are still plenty of small cafés doing takeout, or one can sit and have bagels or more exotic fare served fast and furiously. 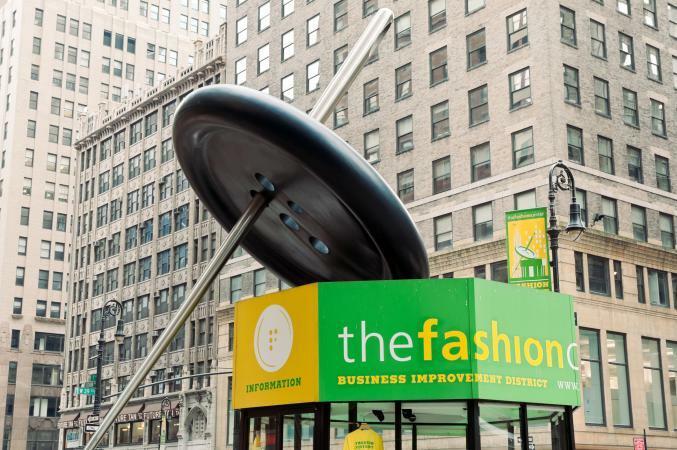 Fashion Center information kiosk in the garment district of Manhattan, New York City. Plenty of New Yorkers, including the mayor and other politicians, want to keep Seventh Avenue and its environs as vital as they have ever been. In 1993 the Fashion Center Business Improvement Center was inaugurated, its mission to promote garment manufacturing, but ten years later BID's concept had changed. The idea is to perhaps create for the district (running roughly from Fifth to Ninth Avenues and West 35th to 41st streets) a 24-hour seven-day-a-week place with diverse and residential units, including a fashion museum and more retail stores. BID's design center will add to the neighborhood's continuing unique personality, and allow it to remain, if not strictly a garment manufacturing area, a fashion district. Gerald Scupp, the deputy director of the Fashion Center (which has its street of famous designers, called the Fashion Walk of Fame, similar to Grauman's Chinese Theatre in Hollywood which has its famous actors' hand-and footprints) notes many initiatives have failed, but he believes, and the report suggests, that abolishing special zoning that restricts non-manufacturing uses and keeps rents low for manufacturers could work. There will be those who will object, however. Rent alone does not explain the declining job numbers, nor do cheap imports, for some manufacturers have defected to cheaper spaces in Brooklyn and Queens, but even this has not been entirely satisfactory. Another factor is the sub rosa conversion to office space with city officials looking the other way, rather than upholding the special district concept, according to Adam Friedman, the network's executive director. He notes the city stopped inspections in 1993. Also taking a toll on legitimate design houses in New York City are manufacturers who violate the law by not paying overtime or taxes, so many of their workers do not show up on official job statistics. If all workers were truly accounted for, the number of city garment workers might double, according to Louis Vanegas, district director of the Wage and Hour Division of the U.S. Department of Labor. But even Vanegas agrees the uncounted jobs are declining and don't really account for the precipitous drop in manufacturing. So, what will happen to Seventh Avenue and its environs if jobs decline at historic rates? According to the BID report in the early 2000s, only about 17,000 of the city's 50,000 apparel manufacturing positions will be around by 2010. However, as of early 2004, fashion-related businesses still make up the majority of the district-64 percent or 4,245-but more of these are showrooms or mixed uses. Other tenants range from printers, ad agencies, theaters, and an unknown number of illegal residential tenants who are tucked away in lofts and other spaces. Actually, the area is becoming more residential legally, and BID supports the idea. Many property owners would love to see zoning laws changed. That the problems of Seventh Avenue remain is borne out by a Woman's Wear Daily article on June 10, 2003 headed "U.S. Makers Fading Away." 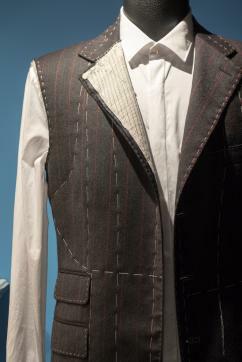 The piece, by Scott Malone, notes, "The withering of the nation's production base has gotten to the point where even the makers of high-end apparel, who typically were able to digest the higher costs of domestic production because of their higher prices, have begun to break into camps on the question of whether making clothing in the U.S. will remain a viable strategy for the years to come." The article maintains that the same economic pressures that pushed most mainstream apparel manufacturing out of the country are taking hold in the top-drawer designer market. "Eventually all that will be left in this country will be a small clique of sample makers." But all is not lost for the Seventh Avenue of the early twenty-first century. The article makes clear there is still a shrinking group of high-end designers whose dresses carry three or even four-figure price tags who contend that domestic manufacturing in New York continues to make sense. These businessmen argue that being close to their factories allows a higher level of quality control and a faster rate of turnaround than is available overseas. Bud Konheim, "the quick turnaround guy" of Nicole Miller says, "The advantage of being domestic has nothing to do with cost." What keeps half of his company's manufacturing here are garment-district contractors. Konheim says, "You can get cheaper prices by going offshore, but then you've got a longer lead time; you have to make your decisions earlier, and you have to cut bigger quantities, so you have a lack of control. And, lack of control, in this marketplace, is very dangerous because some orders you take are not real orders. You have people canceling." He adds that domestic manufacturing is viable only if a brand's fashions are sufficiently distinctive so that retailers can't get a similar product elsewhere. Another major manufacturer, who is also a highly prized designer, Oscar de la Renta, whose firm has long been on Seventh Avenue, still makes the majority of his line in the United States. For him also, quality concerns are a key reason for staying here. The firm's mixture of local and foreign sourcing has not changed since the early 1990s. Famed handbag and accessories firm Judith Leiber continues to manufacture on West 33rd Street because so many of its workers have been with the company for a long time and their talents are specialized. However, one of the problems of the apparel industry decline is that so many of the businesses that supported companies like trim suppliers or firms that stocked replacement parts died because of lack of customers. Konheim said his company has to contract many operations overseas including beading, embroidering, and hand knitting, because it no longer can find domestic companies doing that work. Ironically, at a time when going global has caused so many problems for unique Seventh Avenue and its environs, the cachet of a "Made in the U.S.A." label remains high in Asian markets as well as in the United States and throughout the world, so there is hope. Nowhere where apparel and its appurtenances are created is there the excitement that was and is Seventh Avenue with its polyglot charisma, its smells and street noises, its buying and selling, its rushing and stopping, its garment racks flying down the street in competent hands. Clothing is manufactured around the world, but no one has a Seventh Avenue except New York, New York. See also Fashion Designer; International Trade in Garments; Judith Leiber; Ready-To-Wear. Curan, Catherine. "More Fashionable Garment Area Plan." Crain's New York Business (10 March 2003). Fredrickson, Tom. "Garment Area Jobs Stripped." Crain's New York Business (26 March 2001). Malone, Scott. "U.S. Makers Fading Away." Women's Wear Daily (10 June 2003): 10. Sices, Murray. Seventh Avenue. New York: Fairchild Publications, 1953. Outdated, but provides interesting earlier background information on Seventh Avenue.